With 3Po and Jammy at school with The Pea, at least from 8 till 12, you'd think I'd be sitting on the couch eating bonbons till noon every day ... but I'm busier than ever! Fortunately my twins are on similar schedules, but I'm having to juggle 2 different dismissal times along with volunteering, playdates, afterschool activities, exercising housework, laundry, errands,and blogging. I'm in the van a lot, so I'm grateful for the Parrot MiniKit Chic hands-free car kit that allows me to take calls on my cellphone while driving if I need to. I reviewed the Parrot MiniKit Chic last week, and I really like it because I can use it without being distracted from my driving. Win it! Parrot has generously provided another safe, stylish Parrot MiniKit Chic for one lucky Bonggamom Finds reader! To enter, simply go over to the Parrot website and check out their products, then come back here and leave a comment telling me which one catches your fancy (this is required for entry and must be done before any other entries count). 1) Leave a comment on my Parrot MiniChic Kit review post, then come back here and leave a comment to let me know. 2) Follow Parrot on Twitter, then come back here and leave a comment with your twitter id. 4) Fave Finding Bonggamom on Technorati (leave a comment with your Technorati id). This giveaway is open to residents of the US and Canada, and ends at midnight PST on September 21, 2009.; I will draw a winner at random on September 22 and post the winner's name on the comments section soon after. For additional giveaway rules, click here. Good luck! Last week I took 3Po and Jammy to McDonalds for a First-Day-of-School treat (yeah, yeah, I know, bad mom, but hey, they only get 1 first day of school and that's what they asked for). We were so excited to see that the Happy Meal toys are Lego Racers and American Girl! Of course the boys were ecstatic about the Lego cars, but I was quite amazed to see American Girl pop up at McDonalds, of all places. American Girl things are usually so expensive, so it's nice to see them reaching out to a broader audience, and I'm glad that it gives The Pea an affordable opportunity to add to her colleciton of American Girl things. This series of Happy Meals started on August 17, so I'm hoping we can still get more of the collection. The good thing is, you don't actually have to eat a Happy Meal to get the toy -- you can buy them separately for about $1.50! I did not receive monetary compensation or a product sample for this post. The views and opinions expressed here are my own. I'm so excited that Disney on Ice is coming to our corner of the globe this fall! With The Pea doing so well with her skating (she's now in Freestyle 1! ), I don't think we can afford to miss this show. The kids are going to enjoy the stories and the costumes and music and the production, but The Pea will have the added excitement of seeing professional skaters do moves that she's working on (and other moves she sees the bigger girls do). Get 4 tickets for just $44 by entering the code "MOM" in the box marked "MC promotion". Offer good on all weekday performances, which includes all weekday evening and Friday matinee performances; minimum purchase of 4 tickets required; additional tickets above 4 can be purchased at $11 each. All weekend performance tickets will be $4 off the original price (not valid on Front Row or VIP seats or combinable with other offers including opening night offers). Get the best Front Row and VIP seats available – We have reserved seats in the Front Row and VIP sections just for you! No discounts available on these seats. Use the code MOM. I did not receive a product sample or monetary compensation for this post. The views and opinions expressed here are my own. To download the coloring pages, click here. And they've got other fun back-to-school craft and snack ideas at http://www.wubzy.com/. Enjoy! As with Klutz's other Paper Fashions books, girls can use the ideas and materials in Paper Fashions Fantasy to easily create amazing paper clothes. This book is special because the style is fantasy -- girls create clothes for different kinds of fantasy creatures like mermaids, princesses, fairies, goddesses, even witches. The book contains plastic stencils so kids can trace perfectly proportioned skirts, bodices, sleeves, gloves, capes, hats, and more. They trace their designs onto paper, cut them out, mix and match pieces together, and glue on embellishments. In the Klutz paper fashions tradition, this book comes with everything girls need to design an entire one-of-a-kind wardrobe, including irresistibly tiny hangers to finish the fashions in style. Unique to this book, though, are fashions that are the stuff of fantasy: goddess gowns, pretty princess dresses, fairy finery, and more. Specially designed papers and stencils make it simple to create everything from flowing cloaks and twinkling tiaras to mermaid tails and fairy wings. And we've even added glitter to the glue — a simple way to sparkle up any fashion. When I first saw the book, I wanted to keep it all to myself. Seriously. The papers are so pretty that I wanted to frame the whole thing and keep it forever and ever. But The Pea beat me to it, and she and her cousins were soon hard at work designing their fantasy outfits. Even 3Po and Jammy got in on the fun (maybe they'll grow up to be Tim Gunn; no, they were designing fantasy gowns so maybe they're following in Christian Lacroix's footsteps). There were more than enough stencils and materials to keep five kids busy at the same time, and BOY did they have fun! And their outfits turned out so beautiful. You wouldn't think these young kids could come up with such lovely paper dresses, but I think they did a great job. The book even includes tiny metal hangers to hang your creations in! Sooooo cute! (I'm happy to say that I did get a chance to make an outfit of my own. I waited till they were asleep, ignored Alfie's teasing about overgrown babies and other childish taunts, and had some fun of my own. Ha. So there, Pea, mama did get to try the book out after all. However my outfit was not up to my standards so I'll have to find another night to make a better outfit. Not that I'm addicted to Paper Fashions or anything. But stay tuned for my fab fantasy dress in a future post). The book itself is as high-quality as all of Klutz's books. The book includes enough materials (paper, glitter, beads, ribbons, sequins, glitter glue) to make a ton of paper dresses, but you can use the book long after they run out. 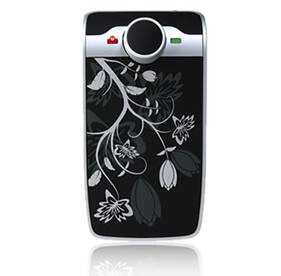 There are step-by-step instructions that clearly explain how to trace and cut and paste and embellish. Each page contains a ton of illustrations, photos, ideas and suggestions to make sure that your child will never run out of inspiration. I particularly loved the photos of real-life models strutting across the runway in real-life haute couture dresses designed in all the fantasy styles. You wouldn't think that these fantasy fashions actually appear in real life, but the proof is there, in all its gorgeous glory. As with most of these craft books, I have a hard time keeping all the parts and materials together! The plastic flap in front snaps open and closed, but I'd have preferred a zippered pouch -- and the sleeve for the papers really needs to be a bit larger in order to fit all the stencils as well as the papers. It would also be great to have a flap that snaps shut in order to make sure that the little scraps of paper don't fall to the floor. Klutz Paper Fashions Fantasy is a dream come true for any girl who loves to design beautiful clothes! It's a wonderful way to occupy their time -- at home, on a playdate, or while traveling (just remember to pack a ziplock bag to store materials and creations). Parents will love the way this book exercises their daughter's creativity and sparks her imagination! 3) Fave Finding Bonggamom on Technorati (leave a comment with your Technorati id). This giveaway ends at midnight PST on September 17, 2009.; I will draw five winners at random on September 18 and post their names in the comments section soon after. For additional giveaway rules, click here. Good luck! Parrot’s MiniKit Chic ($99.99) is a portable Bluetooth hands free kit that attaches to your car's sun visor or drops into your purse. It automatically connects to your Bluetooth phone when nearby and automatically synchronizes to your phonebook. And with talk-to-dial name recognition, the MiniKit Chic recognizes and dials the number of the contact you speak, without any prior training. Synchronizing the Minikit Chic with my phone was fairly simple (here's a list of Bluetooth-enabled phones that work with it), and once you get it sync'ed up, it's really easy to use -- which is important, because you do NOT want to be distracted while you're behind the wheel. You don't even need to turn the Minikit Chic on and off while you're driving. As long as your phone's Bluetooth capabilities are turned on and it's in the car with you, the Minikit Chic will work. If your phone rings, just reach up and press the right-side button to answer the call -- thanks to the MiniKit Chic, you're now on speakerphone! You can talk normally, without shouting, while you're driving. To hang up, reach up again and press the left button. Here's a short video clip of the Parrot MiniKit Chic in action. If the person on the other line sounds garbled, it's not because of any quality issues, it's because she's at the beach in the middle of a huge crowd of sun-worshippers. We could actually understand her pretty well, and vice-versa. I really like how the MiniKit Chic clips to my van's sunvisor. I only use hands-free when I'm driving anyway, because I don't talk on my cellphone often enough to need one of those Bluetooth headsets that look like hearing devices strapped to my ear. And how could anyone not like the style? The graceful silver-and-black floral design makes it look like something out of a Beardsley drawing. As the name implies, the device is slim and unobtrusive, although I'd love to see this in a tan design option so it blends in even better with our van's upholstery. We were able to figure out the synchronization process, but for phone book synchronization, voice recognition and other features, the instructions are woefully inadequate (it doesn't even go through all the menu items!). Also, the voice recognition software needs some work; after countless misinterpretations of "Ana" ("Heather", "Tina" and "Ina", to start with), I grew tired of imitating an American accent. Also, using the push-button/dial to scroll through your phone book is cumbersome (i.e. you have to push the button 5 times to get to the "E" entries in your phone book, then you have to turn the dial to scroll through each "E" entry). On the rare occasions that I really need to call someone while I'm driving, I would rather pass the phone to my daughter in the back seat, ask her to dial -- and then take the call on the Parrot Minikit Chic. The Parrot Minikit Chic is better for taking calls than for making calls -- but when you're driving, that's all you should be doing anyway. Which means the Parrot Minikit Chic is a must-have safety feature for any car without an in-vehicle voice-activated phone system. The Parrot's safety and style is a combination you can't resist. 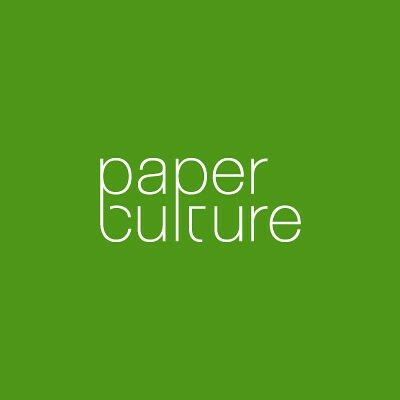 About a month ago I ran a review and giveaway for Paper Culture, the hottest new premium stationery company focused on modern designs, quality eco-friendly papers, and time-saving conveniences. They sent me a sample pack of cards which I was so impressed with, I gave them a glowing review. After the giveaway ended, they were kind enough to send me another set of their cards -- and this time it was a set of cards that was personalized just for me! They turned out so well that I just had to share with everyone how much I love them. To order cards from Paper Culture, you just choose from one of their cute-beyond-words designs, personalize it, and Paper Culture will get back to you with your personalized proof. Once you review and approve the proof, they print it out and mail your cards to you, or they'll mail each card to an individual recipient on your behalf -- for only the cost of the stamp (at least until the end of 2009)! Granted, I would have preferred automating the process (i.e. personalizing and reviewing the cards online), but the whole process was still easy as pie. My cards turned out gorgeous beyond words. They've got those signature rounded corners that I love so much. And when they say they use thick cardstock, they mean it. I ordered 30 cards and they came in a box that looked like they should hold at least 50 cards. I swear, they're as thick as bar coasters, except you wouldn't want to sully these babies with stale beer stains. The Paper Culture designs focus mostly on custom invitations, birth announcements, moving announcements and thank you cards, none of which I really needed at the moment. But they're very flexible, and went along readily with my desire to have some personalized children's birthday cards. I chose their Cupcake Mania birthday invitation design in Light Cyan and Brown. Instead of the What/When/Where/RSVP information, the card read "Have a wonderful birthday from Pea, 3Po and Jammy". They come with envelopes so we can slide the card into the envelope -- or we could punch a hole in one corner of the card, thread a ribbon through it and use it as a giant gift tag. It's the perfect custom-printed card for children's birthday party presents! Here's a great incentive to try out Paper Culture's products: Until August 31 only, you'll get $15 off your order of $75 or more (excluding taxes, shipping and postage). This summer my boys converted to the Church of Bakugan, so it's not surprising that they want everything in their universe to have a Bakugan on it -- their clothes, bags, sheets, curtains, lunchboxes, you name it. I'm not going that far, but getting them Bakugan notebooks and pencils and other small items is certainly within my budget. In June I searched far and wide for Bakugan stuff, but couldn't find any. So it was like the Church of Bakugan had performed a miracle when I found out about the Jazwares 2009 Back-to-School line -- it's all about Bakugan! The Hershey USB drives can be purchased at Best Buy and the Bakugan stationary sets can be purchased at Toys R Us (in stores and online) and Rite-Aid. It's all about the characters, baby! 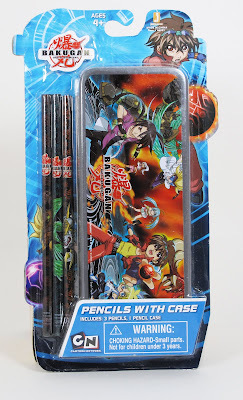 My boys are really into Bakugan -- just like most boys out there -- so this line of school supplies really hit the sweet spot. And speaking of the sweet spot, those Hershey's USB flash drives are SWEET. No, seriously. Litzky PR sent me one that looked like a Hershey's Miniature milk chocolate bar. It was stuck to a cardboard flyer, and I thought it was a real piece of chocolate! I was thinking nice, kind thoughts about the Litzky folks as I tried to unwrap the chocolate, only to discover to my disappointment -- and delight -- that it was a cleverly-disguised USB. Now let's talk about quality and cost. At $7.99 for the 11-pc. Value Set and $4.99 for the pencil case set, this line is highly affordable (the rest of the line is similarly priced), which is great for cost-cutting parents like me. And the quality of the licensing is great. My kids love all the images emblazoned on the supplies. And unlike some licensed products, there are LOTS of images from the cartoon series, not just a lame old logo on the corner. First off, the pencils just don't sharpen properly! Talk about frustrating! I tried three different sharpeners, but the lead tip kept breaking off. Jammy and 3Po sat watching in dismay as I sharpened half of their beloved Bakugan design off the pencil -- so finally I took an Exacto knife and whittled off the rest of the wood to make a nice sharp pencil point. Also, I wish they had some sort of string or chain attached so the USB drive can be clipped onto a zipper pull; otherwise, they'll just fall to the bottom of the kids' backpacks. 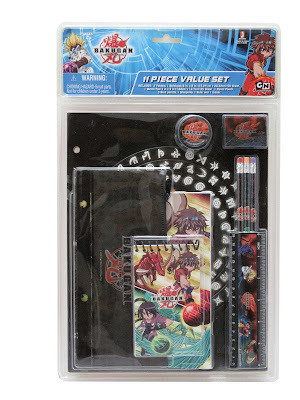 Jazwares are an easy, affordable way to make back-to-school process a little more fun for young Bakugan Brawlers -- and because they love the licensed characters, you know they'll be taking extra-special care of their school supplies. I know my boys certainly will! With school starting on August 25, my kids have begun fixing up their backpacks. Does that mean loading them up with pencils and paper? Heck, no. I'm talking the all-important task of decorating them. They're hanging keychains and zipper pulls, but stickers won't stick to the surface, pins might prick them, and I don't want to risk melting the backpack fabric by using iron-on transfers. Fortunately for everyone, we've discovered PakNaks. We received two PakNak designs (Martin the Monkey and Mona the Violet) to review, which we immediately fell in love with. You do the arithmetic -- 2 cute PakNaks, 3 kids equals fights all around. In a happy coincidence, I actually won 3 more PakNaks from a giveaway on The Optimistic Beauty, and I've gone to the PakNaks website to purchase even more. So my kids' backpacks are now nice and bright and all their own. PakNaks are small (about 3-inch) rubber decorations for bags, backpacks, purses, headbands and other kids' gear. They remind me of giant Jibbitz that you can attach to your bags and other gear instead of your Crocs. PakNaks are not pins or iron-on patches: they have a little velcro dot on the back, and you stick the other side of the velcro onto the surface of whatever you want your PakNak on. The velcro backing stays on the surface, and you can rip off the PakNak and interchange them with other PakNaks. PakNaks are so cute! I think they're a great way to transform generic backpacks, bags and lunchboxes into something bright and personal. When your child outgrows the little kid designs like the dinosaurs and froggies, there are sporty designs as well as skateboards and hot rods for older kids. What do my kids think? The adore PakNaks! In fact, after receiving the product samples, I had to straight back online and buy some more. They currently have 3 PakNaks each, and can't wait to add to their little collection (Jammy even asked me why I don't buy a PakNak for myself). I thought it was very clever of them to market each product as a character with a name and personality, not just a design. My kids love that each character has a best friend, favorite food, and favorite activity. In fact, they insisted I print out the whole product page because they wanted to get to know each and every one better. There's only 1 flaw in PakNaks that I can see: some characters have body parts that are so thin (like Martin the Monkey's tail, or Kyla Jane the Butterfly's feelers) that you just know that at some point, they are going to tear off the main body. Other than that, I can only suggest product enhancements. For one, PakNaks are pretty inexpensive at $3.99, but honestly, it's hard to stop at just one, and it can really add up! I'd love to see some combo saver packs (like 6 for $18). And I'd also love letter PakNaks, so each child can spell out their names or initials in those fun, bright, 3D designs. PakNaks are an easy way to jazz up your kids' gear and a great idea for making Back-to-School preparations a bit more fun. Every kid who sees a PakNak wants one; in fact, I think Santa might have to make a trip to PakNak-land and grab a handful to stuff my kids' stockings this holiday season! 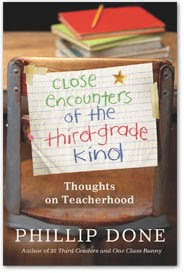 In Close Encounters of the Third Grade Kind, Mr. Done, an award-winning teacher with over 20 years' experience, chronicles the year in the life of a third-grade classroom. From the Back-to-School hubbub to the Halloween Sugar Overload to the final goodbyes at the end of the year, his collection of classroom tales offer funny and touching insights into what it's like being a third grader, and a teacher to third graders. I enjoyed reading Close Encounters just as much as I enjoyed his first book, 32 Third Graders and One Class Bunny! If anyone gets kids, it's Phil Done. He know all their tricks -- but he's game enough to go with the flow when his class leads him into new territory. Which means he constantly finds himself in situations that are hilarious, inspiring, and oh-so-real. And thank God he remembers to write it all down. So Phil has got the material.... and even better, he's got the style. Just like his first book, I shed many tears while reading it -- both tears of laughter and tears that flow when one is truly touched. I would find myself sobbing through one chapter and laughing through the next. Fortunately Mr. Done has a gift for balancing the silly and the sentimental; after a particularly heartwrenching story, Mr. Done takes mercy on his readers and follows it up with a section that's lighthearted and funny (like when he reads a student's science paper and reminds her that Organism should always be spelled with the "ni"). People who've read 32 Third Graders and One Class Bunny may wonder why they need to read Close Encounters -- isn't it more of the same? To that I would say, there are just too many good stories to fit into one book! * Oh, what the heck, this book is for everyone who has ever been in the third grade, because it'll bring back some great memories of a time when the only thing important in life was which animal you got from the box of animal crackers. My kids' elementary school started a zero-plastic bag initiative a couple of years ago. Parents are encouraged to pack their children's lunches in reusable containers instead of ziploc bags to reduce waste, and each class tallies the number of plastic bags they've used in a week. I think this is pretty commendable. It gives children a sense of responsibility and teaches them eco-stewardship early on. It's also freaking inconvenient for me. I'm a lazy eco-conscious person. I realize I need to green up my act, but I like easy solutions. I have no choice with the reusable container thing -- The Pea really keeps me honest. She won't put the sandwich in her lunchbag if it's in a ziploc bag. I'll admit I usually cheat with Alfie's lunch: his sandwich gets put into a ziploc bag. I hate hand-washing those plastic containers, and I'm not looking forward to washing containers for 3 kids. So I need a better solution, and I think I've found it with fabric sandwich containers like ReUsies. 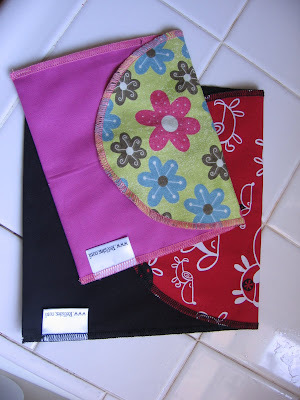 ReUsies are cloth (100% cotton) sandwich bags lined with leak-resistant nylon and secured with velcro closures. They come in two sizes -- snack size, for smaller sandwiches and snacks, and sandwich size, for larger sandwiches -- and a variety of prints and colors. ReUsies are hand-washable, machine-washable and dishwasher-safe. These things are great! First of all, my kids love the cute designs -- it's another way they can put their personal stamp and stand out in a sea of generic lunches. Second, they fit all kinds of food. The snack size bag is just the perfect size for a PBJ or grilled cheese sandwich, and there's an extra strip of velcro to adjust the closure, in case you want to pack some raisins or crackers and don't want the stuff spilling out. The sandwich size bag is great for thicker sandwiches or wraps. Third, they protect the food that's in them. 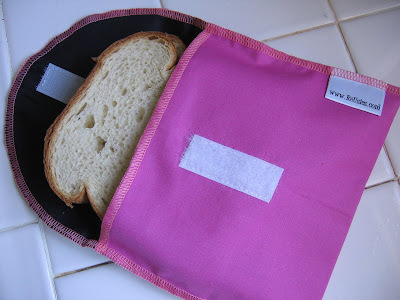 I sent the sandwich-size ReUsie bag on a test run with Alfie, and the sandwiches stayed nice and fresh. But most important of all, they pass my Lazy Test. They are so easy to clean! After Alfie brought his ReUsie home, I turned it inside out, made sure the velcro tabs were pressed together, and threw it into the wash. I washed it on cold and it came out fine! The next time he used them, I washed them in the kitchen sink and let them dry on the dishrack, which worked just as well. They're just like cloth dishtowels and cloth wipes and cloth napkins -- if you have enough of them and wash them regularly, you'll never miss the disposable kind. Many eco-friendly products also help you save money... not this one. At $6.75 and $8.75 retail for the snack size and sandwich size, respectively, you're going to have to use each one around 250 times to compare cost-effectively with plastic sandwich bags ($2.50 - $3.50 for 100 bags). If it lasts that long, that is (If I'm still around in 2011 I'll let you know). If the edge of the flap gets caught on the velcro tabs, the stitching will tear and fray -- so make sure you attach the velcro tabs securely to each other before throwing them in the wash. Yes, ReUsies cost a lot. But it's not all about money. It's about reducing waste and minimizing our impact on the environment and leaving the earth as clean as we found it so our great grandchildren can enjoy it too -- with minimal effort on our part. Isn't that worth the extra money? Which reminds me, I'd better go out and buy more before school starts! Today I'm reviewing the Shred Sled, but I'm not going to follow my usual review template (The Basics/The Bongga/The Blah/The Bottom Line). Instead, I'm going to tell you a story. I've been fascinated with caster boards ever since I first saw them. A skateboard that doesn't require you to push off from the ground! Just wiggle around, and the thing moves by itself! That kid looks like he's snowboarding! I'll bet it's a lot of fun! I've got to get one for the boys! Then I actually stepped on one. And promptly fell off. Okay, it's harder than I thought. And the boys are only 5. They're definitely too young for this. Then I was asked to review the Shred Sled, the next generation caster board with 4 wheels and a dual-deck board. All my optimism surged forth -- okay, maybe I can't do it, but I know The Pea would love it! And once the boys can use it in a couple of years, I know they'll love it too. The Shred Sled arrived, The Pea tried it, and after 5 minutes she gave up. Alfie got on it and decided it was too dangerous for his old bones. We both thought it would end up gathering dust in the garage. But, surprise, surprise. 3Po fell in love with the Shred Sled and insisted he try it. Poor kid -- at first he could barely even position his feet. He's only 5, and his legs are so short that to get his feet in the proper position, he has to spread his legs so wide, almost like a half split, that we thought he would have zero control. But he kept trying. He stayed on for a second or two. Then four or five. Then it turned into ten or twelve seconds. Alfie saw 3Po trying, and his competitive juices bubbled up. He got on the Shred Sled, and his long-dormant windsurfing skills came to the fore. Alfie did it! Which only served to inspire 3Po even more. I held his hand and walked with him as he wiggled around, the way a parent would help steady a child on a bike. Jammy got in on the action. And over the next 2 or 3 days, they both learned to ride the Shred Sled. Now he and his brother Jammy are carving up the sidewalks! They are having SO much fun, now all 3 boys (Jammy, 3Po and Alfie) are fighting for Shred Sled time. Two days ago I tried it with Alfie holding my hands, and I think I've got the hang of it -- sort of. The Pea tried it again yesterday and I'm happy to say that in another day or so I think she'll be almost as good as her brothers. So our Shred Sled story has a happy ending. It's a wonderful product that gets everyone out and about, and we can't wait to go and get more Shred Sleds! And don't forget, the recommended age range for the Shred Sled is 8 and above. Yes, my boys are only 5, -- but they took the training wheels of their 2-wheelers at age 3, and managed to get the basics of snowboarding after their first try, so we let them try it out. We know their physical capabilities, just as you should know your own child's abilities. So don't take this as an endorsement to go out and get one for your 5-year old -- neither Shred Sled nor I can be held responsible for any injuries that occur! 1) Fave Bonggamom Finds on Technorati (leave a comment with your Technorati id). 2) Fave Finding Bonggamom on Technorati (leave a comment with your Technorati id). 5) Join any of the other giveaways currently running on Bonggamom Finds (leave a comment here with the name of the other giveaway you joined). This giveaway ends at midnight PST on September 9, 2009.; I will draw a winner at random on September 10 and post the winner's name on the comments section soon after. For additional giveaway rules, click here. Good luck! One of our most memorable road trips happened in the dead of winter, during our annual trip to Lake Tahoe. The closest town to Hwy. 80, Truckee, is only about 215 miles from Palo Alto, which means we can get to our favorite Soda Springs Resort in about 3.5 hours (and just over 3 hours if we're lucky with traffic, and ignore all bathroom and snack stop requests). The day before our trip we checked the weather forecasts, only to be greeted with snowstorm warnings. We had already rescheduled this trip twice because of bad weather, and I was absolutely crushed. I refused to believe Tahoe could have three straight weekends with hellish weather, and I pulled a mini tantrum. We won't have any winter weekends left! I'll have rebook the hotel again! We're going! All those skiers and snowboarders go every weekend, don't they? It'll be fine, it's just a warning...... Against his better judgment, Alfie agreed to go ahead with it. Click here to find out whether we made it to Tahoe in one piece! I got my first taste of fresh cow's milk at age 6, on my first visit to the US. It was Lucerne milk -- creamy, delicious, and oh-so-different from the tinny evaporated milk we drank in the Philippines -- and I've been a Safeway fan ever since. When I first came to live in the US, as a grad student, I would bike to Safeway and squeeze my groceries into my little bike basket (the Safeway near Stanford is always full of students around midnight!). Now that I'm a parent, Safeway is like a second home to me. I'm always there, buying cartfuls of groceries or dropping by for one or two items we ran out of. Last year, when gas prices soared and the prices of basic items like milk and bread were dragged up with it, Safeway was the only place we could afford to shop. Safeway continues to appeal to this budget-conscious mom with their low prices and quality products. We're also big on yogurt, so I'm glad to see that yogurt is one of the product categories that they dropped prices on. Other new everyday low price categories include ice cream, frozen snacks, cat food, pizza, refrigerated cheese, salad dressing, pasta, and frozen novelties. If your favorite product isn't one of those included in the price cuts, or you don't live in Northern California or Western Nevada, you can still save big by using your Safeway Club Card. You don't even have to have your card with you -- I just type in my phone number into the card swipey-thingy. I like to apply the Safeway Club Card discount right at the very end, because I always get a kick out of seeing the total price drop, drop, and drop some more. Most times I shop at Safeway I save at least 20% as a Safeway Club Card member. Near the checkout stand I saw this neat display that shows how much you can save using Safeway brands. $95 versus $63 -- that's huge! Okay... NOW it's giveaway time! Safeway and Bonggamom Finds are giving one lucky reader the chance to experience the thousands of new everyday low prices at Safeway -- for even less money. How would you like to win a $50 Safeway gift card? Who wouldn't want a $50 Safeway gift card! Leave a comment on this post and tell me what kinds of things you like to buy at Safeway. Don't forget to include your email address so I can contact you. This giveaway ends at midnight PST on August 31, 2009.; I will draw a winner at random on September 1 and post the winner's name on the comments section soon after. For additional giveaway rules, click here. Good luck! *Update* I'm making it easier than ever to enter this giveaway! Now all you have to do is leave a comment, and you're entered! Also, I'm extending the giveaway to Aug. 31 so more people get a chance to win the $50 giftcard. I did not receive any product samples or monetary compensation for this post. The views and opinions expressed here are my own. Those of you who saw me in the Office Max Back-to-School webcast know that I'm big on labeling. With 3 very territorial kids, it's essential to keep track of who owns what. Here's another great Back-to-School organizing tool -- Label Daddy's School Pack, with an assortment of labels for everything your kid can possibly take to school. I've only tried their stick-on clothing labels, so I can't vouch for any of the other labels, but if they're as good as the clothing labels then your kid's stuff will be in good hands, I mean labels. And the Free Shipping on all orders till August 31 (use code SCHOOL) doesn't hurt, either. I did not receive a product sample or monetary compensation. The views and opinions expressed here are my own. Youth in a bottle! At least that's what Ageless claims. They say, "Our patent-pending fragrance elixir defies your skin's natural age-revealing scent. Research has proven that men around women who use Ageless anti-age perfume believe them to be at least 8 years younger!" I think this perfume's a keeper -- I thought it smelled very nice and light and floral. Which shows how much I know about scents -- the box says, "Ageless anti-aging perfume is an aromatic essense of pink grapefruit, mango, anti-oxidant rich pomegranate, jasmine and musk." Whatever -- I don't need to know what's in it to know I like it. I think all the fruit in it must appeal to younger people anyway. When The Pea smelled it, she immediately squealed and sprayed some all over herself. Since she's 8 years old, I wonder whether research would show that men who smell her think she smells like a newborn. Seriously, though, the claim to youthfulness is always appealing, and with all the research being done on pheromones and body chemistry, I don't think it's that farfetched. It's true that vanilla smells calming, rose smells "old-ladyish", and citrus smells energizing -- so why can't there be a scent that signals youth? I can't prove whether Ageless Fantasy has actually captured that youth scent -- unfortunately I find little occasion to be in a roomful of men these days, unless you count Alfie and the twins. But it's all about your mindset anyway: if you think you smell younger, you'll probably feel younger and act younger. At $120 for 3.4 oz., with no smaller size option, it's a pricey investment. Also, Alfie told me I smelled nice, but like a grandmother. I guess it's just not his type -- he has never liked the scent of jasmine, and he always tells me he doesn't understand why women think men want them to smell like fruit. Or maybe his grandmother was just one rocking babe. However, given his reaction this is one perfume I'd rather wear to a ladies' lunch or to a high school reunion (where you want to give off that youthful vibe), not on a hot date with Alfie when I'm hoping for something more than dessert. Buy this perfume because you like the smell, not because you think it's going to turn you into a younger version of yourself. 3Po and Jammy are LOVING the Lands' End backpacks that I picked up for them at last month's MomSelect BlogHer Swag Suite. 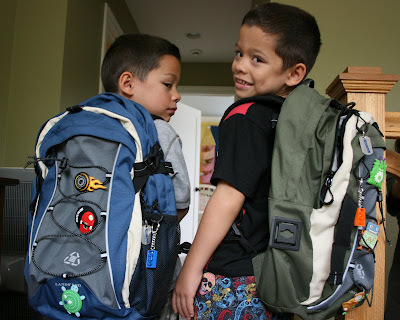 They're the Lands' End Eco-Friendly backpacks, and I was lucky enough to get one in each of their favorite colors, blue and green (heck, I was lucky to get two! I think Amy, MomSelect's representative, let me grab an extra one because I passed on all the other great swag in that room, including the cute Build-A-Bear, fun tiaras and wands, and more -- thanks Amy!). These backpacks have something for everyone to love! My boys love all those compartments and zippers, Alfie loves the zigzag elastic for tucking your jacket or cap into, and I love the rugged durability and Lands' End quality. I do still want to buy them the Lands' End Wheeled ClassMate StudyHaul Backpack, because we walk to school and I don't want them carrying their weight in books on their young backs. But for kindergarten, all they'll be carrying is their lunch, so the Eco-Friendly Backpack will be just fine. 3Po and Jammy are so excited to be using their new backpacks when they enter kindergarten in two weeks, and they've already started decorating them with keychains and zipper charms and stickers. 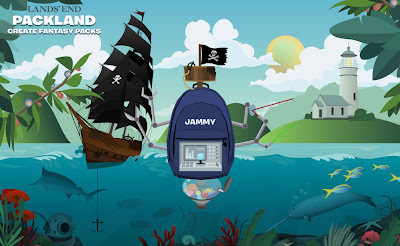 Of course, if 3Po and Jammy really had their way, the backpacks would probably look more like these backpacks we created at Packland, a fun site where kids can create their own fantasy backpacks. Who wouldn't want a backpack with a built-in gumball dispenser and pirate flag? Those are just perfect for back to school! Lands' End hosts will be there to answer back-to-school shopping questions, and there will be lots of chances to win Lands' End products during the party. Save the date! Last Wednesday Mom Central invited us to attend the opening night of Zing Zang Zoom at Oakland's ORACLE Arena. Zing Zang Zoom is one of three Ringling Bros. and Barnum & Bailey circus shows currently on tour. We've been looking forward to this for weeks because, well, hey, it's the circus! Who doesn't love the circus?! The fun started with a special Mom Central pre-show party, where we were treated to yummy circus snacks like popcorn and pretzels and nachos, and given some fun clown noses and hats. We met some of the performers, as well as the show's ringmaster -- oops, I mean Zingmaster -- Alex. He's from the Bay Area, and his mom is actually Belliboo's teacher, so we had a nice bonding moment. Unfortunately I realized that the Kodak Zi6 HD videocam that I got from the SocialLuxe Lounge party at BlogHer is a great digital video camera, but NOT a great digital camera. It doesn't have a flash, so all the indoor photos I took were as blurry as a trapeeze artist in flight. This is the best photo I have of our preshow event; if I get a hold of a photo of us taken by one of the other mombloggers, I'll update this blog with the photo. Because, you know, you can never have enough photos posing with celebrities. And as far as my kids are concerned, anyone in size 20 clown feet counts as a Celebrity. We enjoyed the Mom Central pre-show event, but happily every single Zing Zang Zoom ticketholder got to attend a special pre-show event, starting with an Animal Open House which opened 90 minutes before the show. The kids made a beeline to the elephants, and spent quite a while just staring and enjoying and wishing they had brought along my little Webkinz elephant, Horton Chouchie, so he could see his cousins. On the way to the Animal Open House, we were accosted by animal-rights activists bearing signs saying that this circus mistreats its animals, but honestly (and this is why I bring it up), I think Ringling is much smarter than that, what with all the media attention on this subject! The animals at the open house certainly looked well-fed and content to me. Their pens were scrupulously clean (I wish I had video'd one of the elephants peeing... into a bucket! Yes, they have an attendant who rushed forward with a bucket! I wish I had had someone like that when my twins were toilet training). And later on, during the show, I could see that if any of the animals balked at doing a trick, the trainers didn't force them, and let them go back to their places. Whether you think animals should be performing for people is a separate issue, of course. I personally don't have a problem with it (People perform for people! Little kids perform for people! ), as long as the animals are cared for properly -- and in the case of Ringling Bros. and Barnum & Bailey, I think they are doing a good job caring for their animals. Okay, back to the show.... Zing Zang Zoom ticketholders also got to attend an All-Access Preshow, right on the show floor, one hour before showtime. We posed for pictures with some clowns, watched some short circus acts and generally got a close-up taste of what the upcoming show would be like. If you're all the way up in the bleacher seats, you still get the opportunity to see the performers up close. So don't forget to arrive EARLY! And of course, you'll need some extra time to browse the souvenir stands. We always like to buy a souvenir program (it's the best deal, at only $15) so the kids will always remember what they saw. They also had some cute plush tigers, snow-cones in plastic elephant-shaped mugs, light-up swords, figurine circus horses, and other souvenirs that will have your kid begging for more. So much fun, and the show hadn't even started! And once the show did start, my kids eyes popped out of their heads -- and stayed that way all through the end. Zing Zang Zoom was really quite a good show. My sister and her 3 kids were also in the audience that night, and she said this show was better than the Ringling Bros. and Barnum & Bailey circus that they saw last year. It was certainly much better than what I remember from the one we saw when The Pea was 18 months old (also Ringling Bros. and Barnum & Bailey). This show featured many of the circus acts you'd expect -- tigers, elephants, tightrope walkers -- as well as some that you wouldn't (a clown act performed on the ceiling, entirely upside-down!). I was a bit disappointed not to see some of my favorite circus acts, notably the motorcycles in the circular cage, and the flying trapeeze artists. But I guess those acts are in the other two of Ringling's shows on tour (Over the Top and Coney Island Boom-a-Ring). Some of the acts literally gave me chills. It might be my old age, but I almost couldn't watch the Chinese acrobats flinging themselves around on two swinging logs, or the two brothers going round and round on giant hamster wheels. Amazing! And the music wasn't your old circus calliope tune; it was modern and catchy and interesting, and ran throughout the show, which really tied things together and made it a real spectacle. I like how they've made an effort to update their shows and keep them fresh! Visit Ringling's website for more cities and dates, and visit Ticketmaster for tickets. And guess what? You can purchase a 4-pack of tickets for only $44 by calling 1-800-745-3000, or by logging onto www.ticketmaster.com and entering the coupon code: MOM (Not valid on VIP, Front Row and Circus Celebrity seats or combinable with other offers). This coupon code is valid in select markets across the country; click here to see whether your city qualifies. We received passes to attend this event but no monetary compensation for this post. The views and opinions expressed here are my own. Wow, Disney's Haunted Mansion is turning 40 this year! Usually when someone turns forty the polite thing to say is, you look much younger. Well, I have to say that the ghosts at the Haunted Mansion do look their age, and more -- like a hundred and forty years more! And that's just terrific! Check out this video of the history of the Haunted Mansion -- guaranteed to get anyone's Haunted Mansion Memories flowing. I remember my first visit to the Haunted Mansion well. I was 7 and my sister was 8, and at first we were too scared to go on, although we told ourselves we wanted to save our E-tickets for the Matterhorn and Pirates of the Caribbean. By the end of our visit, we had no E-tickets left and our parents had 2. We decided to use them on the Haunted Mansion. We were terrified! I didn't think I could go on when that first room began to sink and the portratis on the wall began to "grow" and turn scary. But once we boarded the little black cars, everything was fine and we enjoyed ourselves immensely. It's one of my favorite Disneyland rides! I didn't take the kids to the Haunted Mansion when we visited Disneyland last December. There was no more E-ticket excuse this time, but it was really crowded, we didn't have much time, and honestly, my kids were only 7, 4 and 4 at the time, and they're scaredycats just like I was. So we'll have to wait till next time to see the Haunted Mansion. I'm sure the ghosts will still be there, waiting for us to "hurry back". Sometime last month I dropped by my friend Jane's blog and saw she was giving away a set of name cards from HauteMammas.com. I fell in love with Hautemamma's fresh, bold designs and entered the giveaway with fingers and toes crossed. Unfortunately I didn't win, but coincidentally I was contacted by HauteMamma Tiffany, who asked if I would like to receive a sample of products from HauteMamma.com. I couldn't believe my luck! Doesn't that look so bright and friendly? Hautemammas makes personalized calling cards, note cards, gift labels and address labels. The cards make great mommy cards or family cards (so you'll never have to scribble your contact information down on the back of a receipt again!). They also have Babysitter info pads, Pet Sitter info pads, Permission slip pads, and other fun gift items. Yeah, brown has become my new black. I'm really into the anything-and-brown combo. And those adorable swirls make everything look chic and playful. 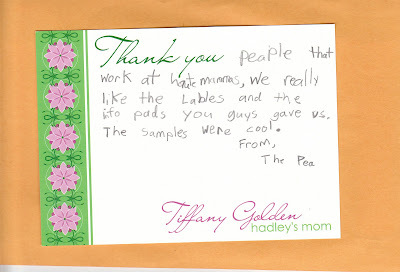 (Note that The Pea's real name is not Tiffany, nor does The Pea have a daughter named Hadley. She wrote on a sample card, and I left the personalization when I scanned her note to show everyone the cute mix of fonts and colors). The designs are girly-girl in quite a bold way, which I personally adore, but if you prefer a more understated, classic look then this may not be the place for you (Males, take heart; they're coming up with a men's line soon). Also, the cardstock for the calling cards is nice and sturdy, but the label paper feels a bit thin to me, almost like print-your-own-label-paper you'd buy at your local office supply store; that being said, I doubt that anyone could get those lovely, bright colors by printing on a home printer!. If you're hip, sassy and stylish -- and you want personalized stationery that leaves no doubt in people's minds that you are -- then go to Hautemammas! I received a product sample for this review, but no monetary compensation. The views and opinions expressed in this post are my own. It's Back to School in a couple of weeks, and I'll be sending 3Po and Jammy off to kindergarten. I'm not worried in the least about how they'll perform, thanks to Alfie's dedicated bedtime reading and the reading activities we've been doing throughout the summer. Oh, and let's not forget to thank the PBS Kids show Super WHY. If your preschoolers haven't gotten into Super WHY yet, it's definitely worth a try. It's entertaining for youngsters because it features four young superheroes -- Alpha Pig, Wonder Red, Princess Presto, and Super Why -- who solve problems by going into fairytale books to search for the answers. It's a very interactive show, much like Dora the Explorer, Go Diego Go and Blue's Clues (the creator of Super WHY is also the creator of Blues Clues), and you'll often hear my kids shouting answers back at the tv. And parents will like the strong educational component. It really helps build those preliteracy skills like letter recognition, word recognition, phonics and rhyming. 3Po and Jammy have gotten a lot of sight reading and sounding out practice with the simple words they see on the Super WHY shows! It looks like we're not the only family out there who love Super WHY, because the last Super Why DVD giveaway I hosted on Bonggamom Finds drew quite a few responses.... so we're having another Super WHY DVD giveaway! One lucky Bonggamom Finds reader will win the DVD Super WHY! Jack and the Beanstalk & Other Fairytale Adventures, which just came out on July 29th. We received a copy of the new Super WHY DVD several weeks ago, and my kids love it. 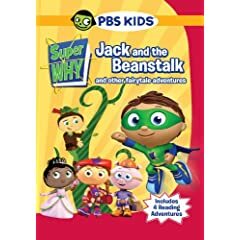 Their favorite episode is Jack and the Beanstalk, where the 4 Super Readers figure out how to soothe Super Why's (or Whyatt's) little sister by going into the Jack and the Beanstalk story and learning how Jack soothes the giant. The DVD also has 3 other episodes: the Princess and the Pea, The Three Little Pigs, and Little Red Riding Hood, as well as special features like coloring pages, music videos and interactive games. If your child is a Super WHY fan, you've got to get this DVD -- but if you're lucky, you could win your own copy! Required entry: Leave a comment on this post and tell me which Super WHY character your child would love to be. Don't forget to leave your email address or other means of contacting you. This giveaway ends at midnight PST on August 24, 2009.; I will draw a winner at random on August 25 and post the winner's name on the comments section soon after. For additional giveaway rules, click here. Good luck! It's almost time for school to start once again, and this year I've got three kids in elementary school now! I'm going to have to figure out a way to pack 3 mid-morning snacks and 4 lunches (yes, I pack lunch for my husband as well!) and get 3 kids ready for school in the morning. And I'm going to have to rely on healthy, easy-to-prepare snack foods more than ever -- which is why I was happy to join BlogHer's Lance Snacks review, and try out some of their new healthier snack products. Click here to find out what we thought of Lance's new line of sandwich crackers! Mabels Labels, you are a mindreader! Remember when I reviewed your Classic Sticky Labels several months ago, and the only thing I could kvetch about regarding Mabels Labels was that we couldn't split an order between 2 names. Et voila, now they've come up with the Mabel's Labels Back to School Combo , which has samples of their best-selling labels in smaller amounts. You don't have to buy each product individually and end up with far too many labels, which means I don't even need to split an order. 50 Tag-Mates -- The ultimate in convenience, these are stick-on clothing labels. 40 Skinny-Minis -- These are like the Classic Sticky labels, but smaller, so you can stick them on spoons, pencils, scissors and other school supplies. 2 Teeny Tags -- These are sturdy metal tags, like the Bag Tags, but smaller. The pack costs $39.99, which is roughly the sum of the pro-rated cost of each of the individual items. * In addition, the clothing labels are laundry safe (BTW, here's a tip: the Tag-mates stay really well on clothing tags, so if the clothing item does have clothing tags, make sure that's where you stick the Tag-mates on). Also, my kids love the labels! The shoe labels were surprisingly comfy; The Pea made of point of telling me that she couldn't feel them at all when wearing her shoes. They really enjoyed choosing the color schemes, and took ages selecting which icon they wanted on their labels (finally they settled on a sea star, skull and cow). The labels turned out so adorable, the've put my kids into a labelling frenzy. I had to work very hard to convince them that they did not need to put labels on the leather car seats. I swear, if we had a dog they'd probably slap a label on him too. Some of the shoe labels we received were not die-cut all the way through, so I had to cut them out myself with scissors. I assumed this was a fluke or one-off quality problem -- but the important thing is that when I emailed the company about it, they immediately offered to mail out a replacement. So in the end, it is really great to see that they stand by their satisfaction guarantee (a full exchange or refund if you are not satisfied with any part of your order). Also, the Ultimate Back-to-School combo pack is available only until September 25, boo hoo, so make sure you get 'em while they're here. You can still buy either the Big Combo or Camp/School packs, of course, but in my mind neither of these are as good a deal as the Ultimate Back-to-School combo. 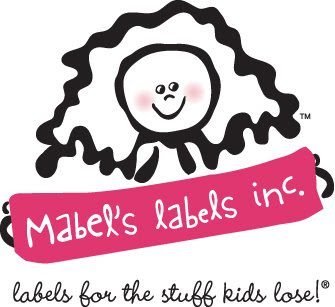 Mabels' Labels Ultimate Back-to-School combo pack is all you'll need to make sure everything you send off with your child to school comes safely back home again! I received product samples for this review, but no monetary compensation. The views and opinions expressed in this post are my own.